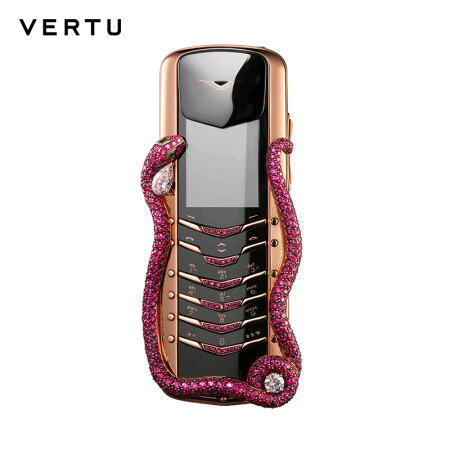 The Vertu Signature Cobra is a limited edition phone which has only 8 units available for sale in the world. The phone is special as it is studded with 439 rubies which have been carefully cut to form a cobra and emeralds have been used for the eyes. The phone is available for sale on the JD mall official site with a price tag of CNY 24,500 ( INR 2.32 crores ) making it one of the most expensive phones yet. But the noteworthy thing is that it is not just a luxury smartphone with an iOS or Android, it is a basic feature phone. The phone still gets a 2 GB RAM and 16 GB internal storage. It also features a removable battery with 5 and a half hours of talk time. The phone does with a basic 2-inch QVGA LCD display protected by sapphire crystal. The device has been manufactured and customized with the help of a French jewellery brand Boucheron. The entire phone piece id made up to 388 parts.